This chest on chest consists of a large oak crossgrain moulded cornice leading down to the top section having two short over three long drawers, the lower drawer originally fitted with a secretaire but this has been removed over the years possibly to create more storage. All drawers having oak cockbeads and oak linings, the drawer fronts consisting of an outer fruitwood banding, straight grain oak panel with wide mahogany line and oak panel to the centre, all drawers with original brass handles, the long drawers with brass escutcheons. 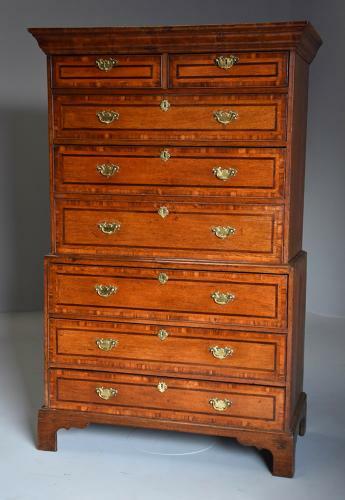 This leads down to the lower section consisting of three long drawers: the drawer configuration is unusual as normally the larger drawer is to the bottom but this chest has the larger drawer to the top graduating down to a smaller drawers below. The sides of the chest are oak and is supported by four bracket feet. This chest is in excellent condition for age, is of stable construction and can go straight into a home, this is a very versatile piece due to the size.